The CXDI-401G COMPACT Digital Radiography System features a 125 micron pixel pitch resulting in high resolution and allows for easy upgrades to existing radiography equipment and fits easily into most universal Bucky systems. This unit can be retrofitted into a range of radiography devices, such as upright stands and tables. With a 125 micron pixel pitch, the performance of the Gadolinium Oxysulfide (GOS) scintillator helps deliver exceptional spatial resolution. The 3 second exposure time allows these sensors to be used with tomography equipment and for other exams that may require these longer exposures. An on-screen preview image is available 3 seconds after exposure. Immediate viewing of high resolution images used in the control software is available on the control workstation (sold separately). 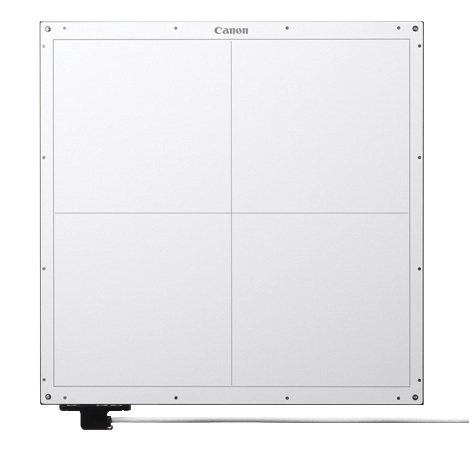 The CXDI-401G COMPACT Digital Radiography System uses the Canon CXDI Control Software NE. The intuitive operation of this software gives a wide range of selections directly from the main menu and yet images can be taken within three touches. The CXDI Control Software NE also has image processing that can show the subtle details of trabecular bone structure and soft tissue in the same image.